Against Legion of Doom Alert, Is Hadi Playing Saleh’s Old Game? After President Obama met with Yemen’s President Abdo Rabu Mansour Hadi on the eve (or during the progression) of the Legion of Doom alert last week, he said this about Hadi’s cooperation on terrorism. I thank President Hadi and his government for the strong cooperation that they’ve offered when it comes to counterterrorism. Because of some of the effective military reforms that President Hadi initiated when he came into this office, what we’ve seen is al Qaeda in the Arabian Peninsula, or AQAP, move back out of territories that it was controlling. Note how this carefully scripted puppet show emphasized Yemen’s own interests in defeating al Qaeda. Here’s what, in the wake of disagreements whether a disrupted plot (that may have had nothing to do with AQAP) had anything to do with the Legion of Doom alert, the WSJ now reports really happened at the meeting between Obama and Hadi. The U.S. raised concerns in meetings in Washington last week, with officials complaining to President Abd Rabbu Mansour Hadi that Yemeni forces weren’t taking the al Qaeda threat seriously and needed to stop pulling back from military offensives, people familiar with the meetings said. Yemeni officials say they have spared no effort battling al Qaeda and its affiliates but that the threat remains too large for their ill-equipped military. The history of U.S.-Yemeni counterterrorism relations has been checkered with missteps and mistakes, even before this latest terror alert. Mr. Hadi—who came to power in large part due to America’s diplomatic intervention—has tried to strengthen military and economic ties with the U.S. It goes onto lay out details of the cooperation — though the reported influx of JSOC members to Yemen may reflect a dramatic departure from this cooperation. At the heart of the U.S.-Yemeni cooperation is a joint command center in Yemen, where officials from the two countries evaluate intelligence gathered by America and other allies, such as Saudi Arabia, say U.S. and Yemeni officials. There, they decide when and how to launch missile strikes against the highly secretive list of alleged al Qaeda operatives approved by the White House for targeted killing, these people say. But local sensitivities about the bilateral counterterrorism cooperation have spiked in recent years due to high-profile civilian deaths by U.S. missiles, prompting tight limitations on any visible American role in the fight against al Qaeda. For example, U.S. Special Forces aren’t allowed to accompany Yemeni units on patrols through the rugged mountains where al Qaeda cells have found haven, military officials familiar with the situation say. But Yemeni units have neither the skill nor political will to take on these sorts of quick-strike operations, the officials said. Instead, Yemeni armed forces conduct periodic high-profile land operations against militants whose affiliation with al Qaeda isn’t clear. But underlying all this parroted language about cooperation is the reality that a focus on Al Qaeda tends to distract Hadi, who already relies on the US and Brits and Saudis to retain power, from issues that matter to Yemenis. This superb Guardian piece notes how counterterrorism delegitimizes him. https://www.emptywheel.net/wp-content/uploads/2016/07/Logo-Web.png 0 0 emptywheel https://www.emptywheel.net/wp-content/uploads/2016/07/Logo-Web.png emptywheel2013-08-08 14:52:042013-08-08 18:50:22Against Legion of Doom Alert, Is Hadi Playing Saleh's Old Game? https://www.emptywheel.net/wp-content/uploads/2016/07/Logo-Web.png 0 0 emptywheel https://www.emptywheel.net/wp-content/uploads/2016/07/Logo-Web.png emptywheel2013-02-18 10:16:422013-02-18 10:16:42Is This Why the Press Finally Revealed the Saudi Drone Base? Is Chinese Elite Looting More Newsworthy than Middle Eastern–or US–Looting? NYT has a really good article today on how the family of Chinese Prime Minister Wen Jiabao has gotten enormously wealthy while he’s been in power. The Chinese government has already started censoring the story itself and discussions of it. And while I applaud NYT’s coverage of the corruption of the Chinese elite, I was left wondering whether NYT would print the equivalent story on Middle Eastern dictators or–even more unlikely–American elites. While there has been some coverage of how Hosni Mubarak, Moammar Qaddafi, Ali Abdullah Saleh, or Zine El Abindine Ben Ali looted their countries of billions now that they’ve fallen, one of the only times we’ve heard about Saudi looting came after Riggs Bank got busted. And while we’ve had reports on Countrywide’s VIP program and the general process by which members of Congress get enormously wealthy on our dime as well as stories focused on those (like Maxine Waters), we rarely see maps like the one NYT drew of the business connections involved. Partly, I wonder whether the US is just better at hiding these connections. Some of this kind of work would stumble on America’s shell corporations, for example. And partly it may be lack of self-awareness. NYT complains, for example, that Chinese disclosure laws don’t apply to extended relatives. Eighty percent of the $2.7 billion in assets identified in The Times’s investigation and verified by the outside auditors were held by, among others, the prime minister’s mother, his younger brother, two brothers-in-law, a sister-in-law, daughter-in-law and the parents of his son’s wife, none of whom is subject to party disclosure rules. But when Congress finally passed a bill cracking down on insider trading this year, it didn’t even cover the spouses of members of Congress and we’re exempting some Executive Branch members on national security grounds. Maybe I’m being churlish. But I really wonder if such a superb article would come out to expose graft of our allies that got deposited into American banks. And I wish we saw more of this kind of reporting about our own corrupt elite. In somewhat related news, Silvio Berlusconi got sentenced to four years for tax fraud today (though appeals will probably save him from jail time). And we still haven’t seen Mitt Romney’s tax returns. https://www.emptywheel.net/wp-content/uploads/2016/07/Logo-Web.png 0 0 emptywheel https://www.emptywheel.net/wp-content/uploads/2016/07/Logo-Web.png emptywheel2012-10-26 11:36:052012-10-26 11:39:33Is Chinese Elite Looting More Newsworthy than Middle Eastern--or US--Looting? What Was the Evidence Supporting the First Strike on Anwar al-Awlaki? According to the William Webster report, the FBI’s understanding about Anwar al-Awlaki’s operational role developed only after the UndieBomb attack. On December 24, 2009–the day before FBI began to understand Awlaki’s operational ambitions–a JSOC strike in Yemen missed Anwar al-Awlaki. Dana Priest’s report revealing Awlaki was subsequently added to a JSOC kill list, published three days before Umar Farouk Abdulmutallab started cooperating again with the FBI, claims Awlaki was not the target of that December 24, 2009 strike. 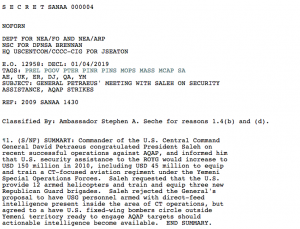 But Ali Abdullah Saleh, speaking with David Petraeus three weeks before Priest’s report, sure seemed to treat Awlaki as one of two targets of the strike. 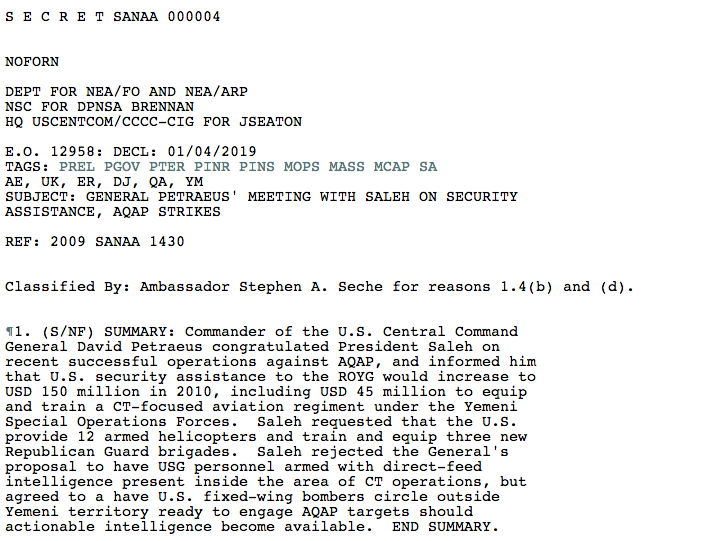 Given that we blamed Saleh for the strike, you have to assume he knew who the targets were. And he seems to suggest that both Wuhayshi and Awlaki were the intended targets. https://www.emptywheel.net/wp-content/uploads/2016/07/Logo-Web.png 0 0 emptywheel https://www.emptywheel.net/wp-content/uploads/2016/07/Logo-Web.png emptywheel2012-07-25 16:17:152012-08-17 12:28:32What Was the Evidence Supporting the First Strike on Anwar al-Awlaki?